The brain is one of the most complex systems known to man. It consists of thousands of billions of neurons that constantly interact by emitting electrical impulses called spikes. When trying to understand how these neurons encode information from the sensors (e.g., visual, auditory, tactile sense), one records their spikes and attempts to discover patterns that are associated to given stimuli. Unfortunately, it is very difficult for us to comprehend how multiple neurons fire spikes together to encode information because there is a vast amount of possible patterns. Scientists at the Center for Cognitive and Neural Studies (Coneural), that is part of RIST, have developed in collaboration with the Max Planck Institute for Brain Research in Frankfurt a special visualization technique to solve this difficult problem by representing the identity of firing patterns of multiple neurons with color sequences. Their method was published in Journal of Neurophysiology (Jurjuţ O.F., Nikolic D., Pipa G., Singer W., Metzler D., Mureşan R.C., A color-based visualization technique for multi-electrode spike trains. Journal of Neurophysiology 102: 3766-3778, 2009), a journal of the American Physiological Society. 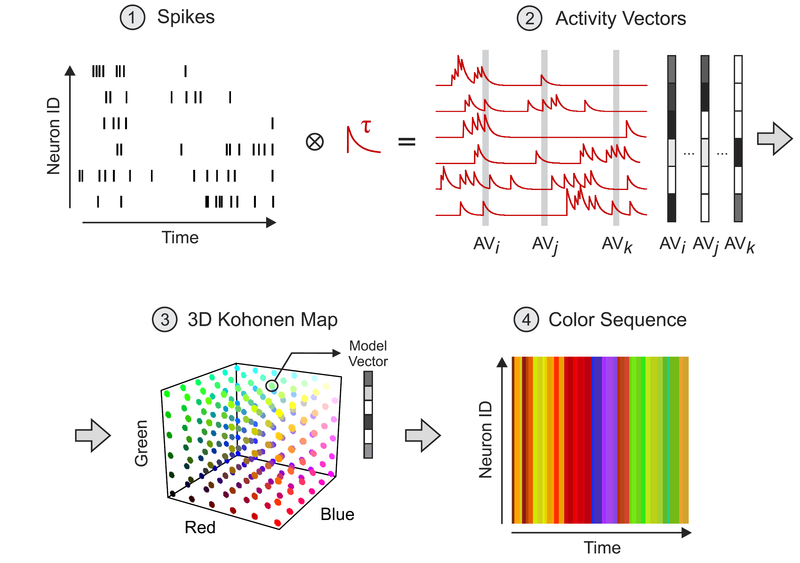 Color sequences prove versatile and efficient to discover firing patterns corresponding to different visual stimuli, across different timescales, and are useful to detect changes in the state of the brain, the so-called cortical-state changes.